Austin, Texas—November 25, 2014—Ground has been broken on a third building for the southwest Austin campus of the University of St. Augustine for Health Sciences (USA). Expected to open near the end of May, the 10,000-square-foot building will house an occupational and physical therapy clinic that will serve the public, a wellness center and therapy pool for patients and students, and classrooms and labs. “The new building will expand our ability to serve the local community and give students more opportunities for hands-on learning,” said Dr. Wallace Pond, USA’s chief executive officer. 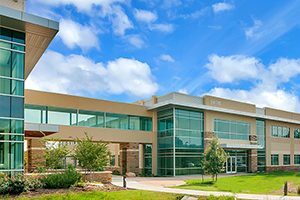 USA’s Austin campus enrolls approximately 300 students in its Doctor of Physical Therapy. It opened with a new building in 2012, and its second building opened in September, adding classrooms, labs and study areas.